↑ Waples, James T. (2008). 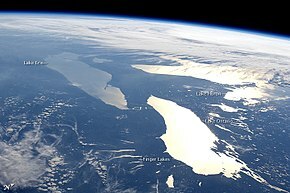 "The Laurentian Great Lakes" (PDF). 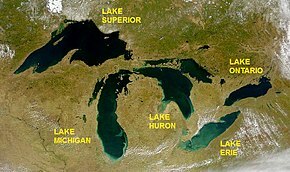 North American Continental Margins (Great Lakes Environmental Research Laboratory): 73–81. http://www.glerl.noaa.gov/pubs/fulltext/2008/20080024.pdf. ↑ "Great Lakes – U.S. EPA". Epa.gov. 2006-06-28. http://www.epa.gov/glnpo/basicinfo.html। আহৰণ কৰা হৈছে: 2011-02-19. ↑ "LUHNA Chapter 6: Historical Landcover Changes in the Great Lakes Region". Biology.usgs.gov. 2003-11-20. Archived from the original on 2012-01-11. http://wayback.archive.org/web/20120111122929/http://biology.usgs.gov/luhna/chap6.html। আহৰণ কৰা হৈছে: 2011-02-19. ↑ "Great Lakes: Basic Information: Physical Facts". United States Environmental Protection Agency (EPA). May 25, 2011. Archived from the original on 2012-05-29. http://web.archive.org/web/20120529233616/http://www.epa.gov/glnpo/physfacts.html। আহৰণ কৰা হৈছে: November 9, 2011. ↑ Williamson, James (2007). The inland seas of North America: and the natural and industrial productions .... John Duff Montreal Hew Ramsay Toronto AH Armour and Co.. http://books.google.com/books?id=ydMNAQAAMAAJ&pg=PA7। আহৰণ কৰা হৈছে: January 5, 2014. ↑ Hough, Jack (1970). "Great Lakes" (Hardcover). The Encyclopædia Britannica. 10 (Commemorative Edition for Expo'70 সম্পাদনা). প্ৰকাশক Chicago: William Benton. পৃষ্ঠা. 774. ISBN 0852291353. ↑ Linda S. Cordell; Kent Lightfoot; Francis McManamon; George Milner (2008). Archaeology in America: An Encyclopedia: An Encyclopedia. ABC-CLIO. পৃষ্ঠা. 1. ISBN 978-0-313-02189-3. http://books.google.com/books?id=arfWRW5OFVgC&pg=RA1-PA25.